(Nanowerk News) With its palm open, the robot is completely motionless. A split second later, it suddenly unwinds and catches all sorts of flying objects thrown in its direction -a tennis racket, a ball, a bottle-. This arm measures about 1.5 meters long and keeps an upright position. It has three joints and a sophisticated hand with four fingers. It was programmed at the Learning Algorithms and Systems Laboratory at EPFL (LASA) and designed to test robotic solutions for capturing moving objects. It is unique, as it has the ability to catch projectiles of various irregular shapes in less than five hundredths of a second. This invention is described in an article published today by IEEE transactions on robotics, the first journal in the field. "Increasingly present in our daily lives and used to perform various tasks, robots will be able to either catch or dodge complex objects in full-motion, said Aude Billard, head of LASA. Not only do we need machines able to react on the spot, but also to predict the moving object's dynamics and generate a movement in the opposite direction." The ability to catch flying things requires the integration of several parameters and reacting to unforeseen events in record time. "Today's machines are often pre-programmed and cannot quickly assimilate data changes, added Aude Billard. Consequently, their only choice is to recalculate the trajectories, which requires too much time from them in situations in which every fraction of a second can be decisive." The research was conducted with a ball, an empty bottle, a half full bottle, a hammer and a tennis racket. These five common objects were selected because they offer a varied range of situations in which the part of the object that the robot has to catch (the handle of the racket, for example) does not correspond to its center of gravity. The case of the bottle even offers an additional challenge since its center of gravity moves several times during its trajectory. When projected into the air, all these items will make even more complex movements, often involving several axes. As a result, when the moving objects are submitted to the robot's abilities, the outcomes turn out quite interesting. 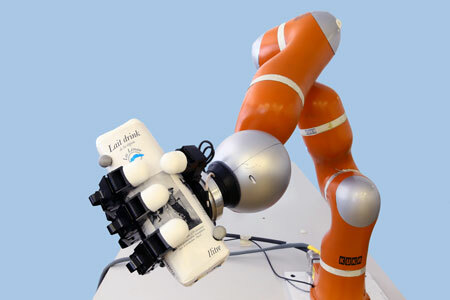 In the first learning phase, objects are thrown several times in the robot's direction. Through a series of cameras located all around it, the robot creates a model for the objects' kinetics based on their trajectories, speeds and rotational movement. Scientists translate it into an equation which then allows the robot to position itself very quickly in the right direction whenever an object is thrown. During the few milliseconds of the approach, the machine refines and corrects the trajectory for a real-time and high precision capture. This efficiency is further enhanced by the development of controllers that couple and synchronize the movements of the hand and fingers.